Record-breaking cold expected on Wednesday, Jan. 30, as morning lows bottom out around -20. The daytime high could peak at -12 with the coldest daytime wind chill around -40 to even -50 degrees. The Wind Chill Warning continues for everyone until 2 p.m. on Thursday. * WHEN...Until 2 PM EST /1 PM CST/ Thursday. cause frostbite on exposed skin in as little as 5 minutes. 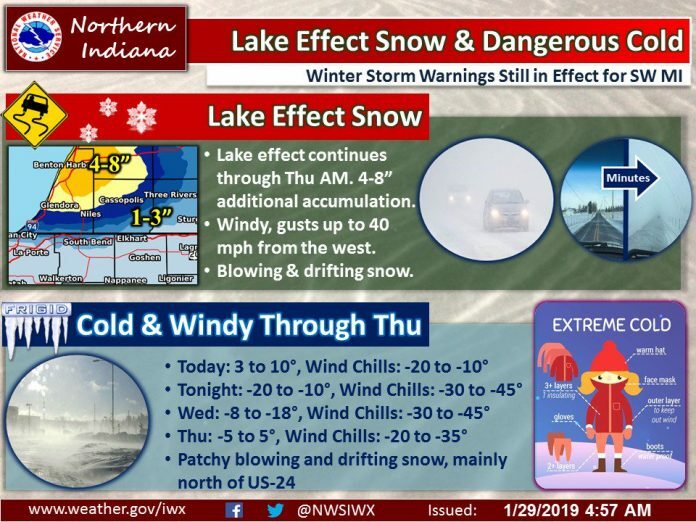 Lake-effect snow showers will continue in southwest Michigan on Wednesday, making travel hazardous through Thursday morning. Another round of system is likely Thursday night into Friday morning, resulting in more accumulating snow for everyone. Afterward, a big warm-up is on the way through the weekend as temps peak in the mid to upper 40s with rain showers expected Sunday and Monday. Some flooding/re-freezing problems could be possible with highs well above freezing, but with lows dropping below 32. Wednesday: Extreme, historic cold. L.E. snow showers in the MI counties. High of -12. Wednesday Night: Partly cloudy with continuing L.E. snow showers. Cold. Low of -22. Thursday: Partly sunny with L.E. snow fading, then mostly cloudy with a chance of late PM snow. Cold. High of 0. Thursday Night: Snow likely after 8pm. Mostly cloudy, with a low around -3. South wind around 5 mph becoming southeast after midnight. Chance of precipitation is 70%. New snow accumulation of 1 to 2 inches possible. Friday: Snow likely before 8am. Mostly cloudy and cold, with a high near 20. Chance of precipitation is 70%. New snow accumulation of less than a half inch possible. Friday Night: Partly cloudy, with a low around 11. Saturday Night: A 30 percent chance of rain after 2am. Mostly cloudy, with a low around 35. Sunday: A 40 percent chance of rain. Cloudy, with a high near 46. Sunday Night: Rain likely. Cloudy, with a low around 37. Chance of precipitation is 60%. Monday: Rain. High near 47. Chance of precipitation is 80%. Monday Night: A chance of rain. Mostly cloudy, with a low around 29. Tuesday: Partly sunny, with a high near 35.